The best advice I can give to new Kamado owners it to just use your grill, don't worry about everything being dead on time / temps and just enjoy the art and fun of cooking and then eating some of the best food ever prepared. You'll have lots of crap meals but it's all about learning and having fun. My first, second, third etc.. attempt at ribs were all Grade A failures! and my first Pulled pork was the best and I can't seem to replicate my results.. I also document in as much detail as possible(Temps, Times, Check-Ins, Looks, Charcoal, Weather etc...) every new cook until I'm grilling winners. Steak: Strip Loin or Tender Loin about 1 1/4 inches thick. Dry the steak before I apply the magic, just dab with paper towel. I season the steaks. I don't do it the same way, always shake it up but a key is Salt. Not too much but not too little. You can over salt, but it's easier to undersalt. Depending on the salt content of the spice I'll add additional salt or not. and ALWAYS fresh ground pepper. Usually lots and never find it's too much. I then RUB emotionally the spice / salt / pepper into the meat. Making sure it's all covered and looking great! Let sit on a plate and keep my cats(who eat nothing but raw meat) away from them. 2. Get that Grill as hot as possible! This is the best part, takes time but is worth it and I get a thrill with the 900+ degrees and my guests are usually amazed. I'll load that fire bowl up(at 900+ that stuff burns up quick!) and get it lit. Open bottom vent all the way and take the top off. Occasionally go out and stir it around and get some great flame, often It's shooting out the top hole, that's How i know I've got some great heat! I've also killed my thermometer.. Not sure if it was the heat or the Nova Scotian winter..
Once I get it HOT HOT HOT, I'll put that grill in and let that heat up for usually 5-20 mins. Once this is complete My steaks have sat for 30-45 mins. Depending on the cut and thickness they'll sear for 60-90 seconds on either side. Some keys to get the best flame during sear, Keep all vents open/off. 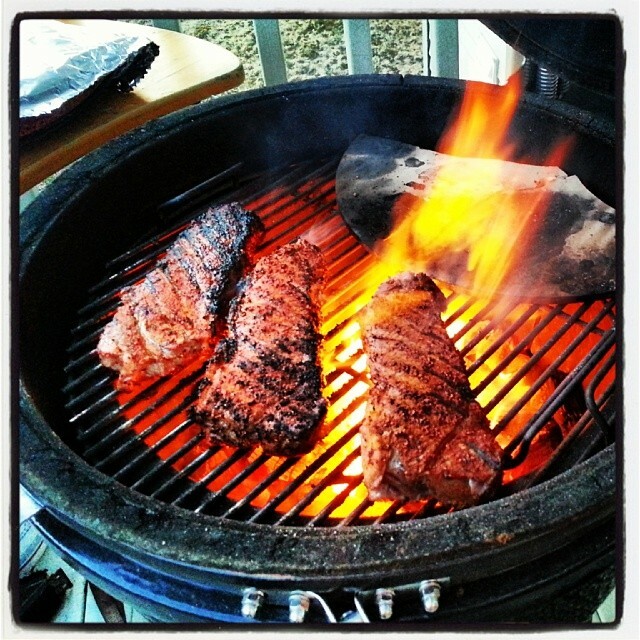 Close the dome during the sear as it will get better flame touching those steaks giving you some beautiful black char. After the sear, I throw them on a plate and wrap in tin foil for 20-35 mins and let rest inside. I'll starve the charcoal of air and start to cook veggies, corn etc... Aiming to get it down to as close to estimated 350 as I can. The veggies have hopefully had enough time to cook and not burn from the fire. * I'll open the bottom vent all the way and get some flames -- This is about 50% of the time, as some of my family doesn't like the real char steaks and claim they're burnt.. It's personal preference really. How much time? Depending on temp of the grill, 350F would be the longest time, 600F would be the shortest. These temps are for roughly 1 1/4 inch Strip loins. Diff Cuts would cook faster than others. The steak will continue to cook while resting, so be careful if they want med rare, med etc... you may over cook to their preference. These will be GREAT! No sauce needed, they're more juicy than you could ever imagine possible. This method has been claimed to be better than $40 steaks you get downtown by my guests. I'd love to hear from feedback on the method, and hope some of you give it a go and let me know. Maybe some of you do something very similar or completely off the concept, It's all on personal taste. I don't use the most expensive beef, My family comes from butcher background so a lot of my beef, mostly tender loin is cut by me. Yowza. Those look awesome. I did my first steaks this weekend and I think did ok, but I want to work on getting that meaty/spicy crust on the steaks a little more. I'm not sure I'm ready for flames shooting out the top of the grill yet, tho! Nice!!! 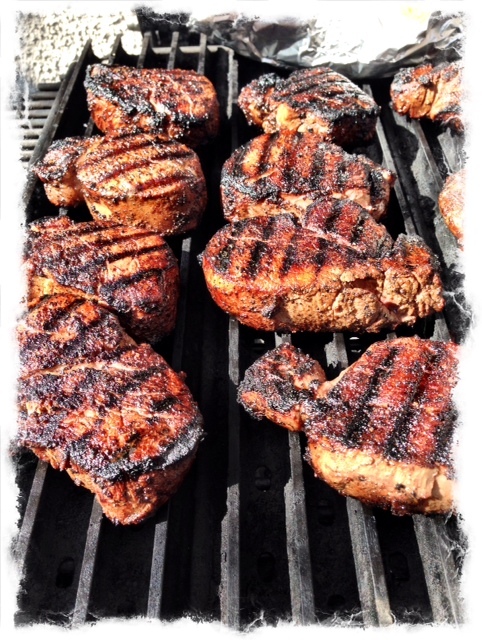 Some of the best steaks I've had were done on Easter. 800 degree sear for 90 seconds per/side... and then finished on a 2nd kamado running at 350. They look great, I prefer the super hot super fast sear like this. We do steak night and have folks bring their fav cut, folks line up at the kamado and stand in line drink in hand while I cook each to order.... at 2-4 min per it makes a nice social. Please show us a picture of what the inside of the steak looks like using this method. Thanks. 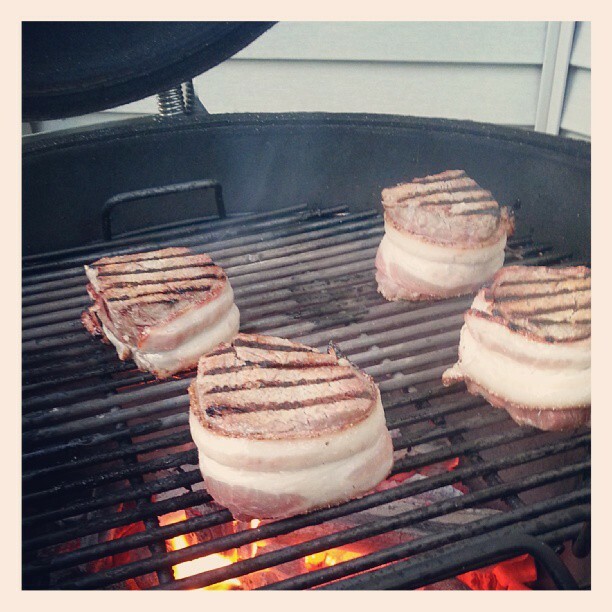 Nice looking steaks. I agree that it is valuable to record your cooks in a book until you have it tweaked to the best it can be. Keeping a record was one of the best tips I ever got. When i want to know something I just go back and say not what were the particulars and then reproduce them. It is funny how useful the book can be when you are looking at doing something you last did months ago. I have 2 ribeyes sitting in the fridge waiting for tomorrow nights grill. I can't wait to try out your method!! Nice steak cook. Love the flaming steak picture. I mostly do hot and fast sears. Have you tried caveman style? (steaks directly on rageing coals) I think you would like it. I really need to try a caveman steak. Maybe my next cook I will give it a go! !